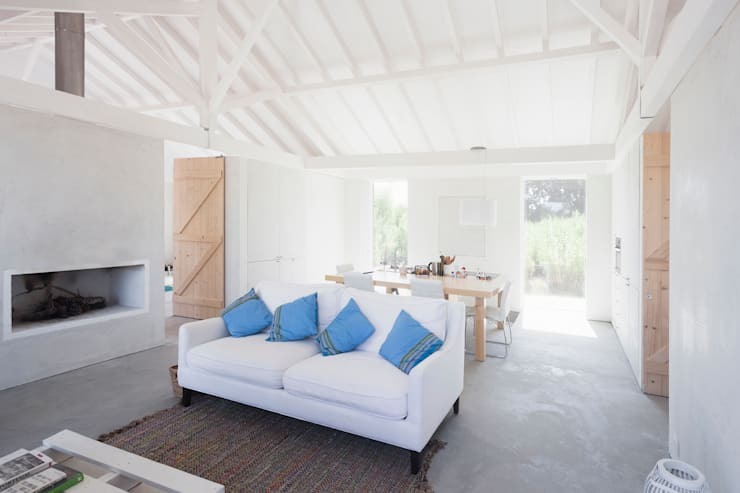 Today on homify we are travelling to Portugal where we will explore a luxurious rural home that was once a stable for horses. The property lies in Alcacer do Sal, a town in the southern Alentejo region of Portugal. The area is largely agricultural and this particular plot of land is blessed with a riverside setting and 14 hectares of tranquil surroundings. The original 212 square meter building was composed of a central corridor with divisions running off each side for the stables. 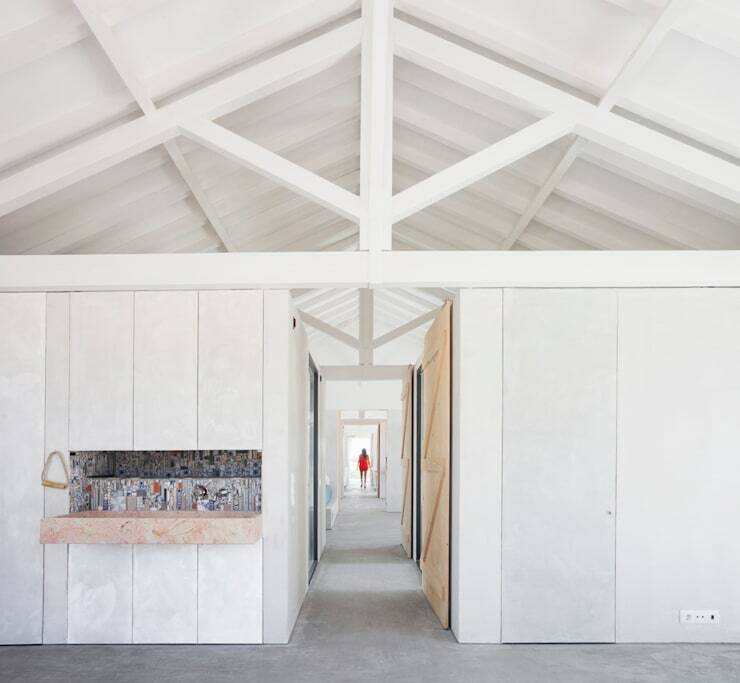 But once the architects Philip Rodrigues Inês Vicente and Marta Frazão of Atelier Data got hold of the property, its days of horse manure and hay were certainly numbered. We won't spill all the details just yet, but we will say that they created a luxurious rural holiday home that somehow manages to retain the essential rustic layout and simplicity of the original building and layout. Come with us on a photo tour for beautiful photos and interesting details. The original stables were white and simple as a child's drawing. They were typical of the region and fit into the surrounding landscape. 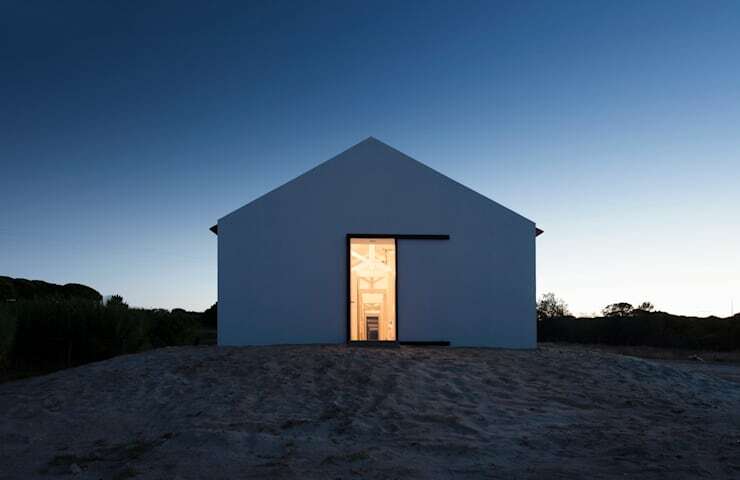 The transformation was modest from the facade as the architects intended. Traditional plaster and materials were used and the innovative and contemporary design was limited to the interior of the property. The only hints of the inner changes are limited to the bright and open doorways. The original building was composed of a central passageway with subdivisions for the stables on either side. This layout was retained and the stable areas were converted into five similar divisions. As mentioned earlier the property is located in the warm region of southern Portugal and the central passageway was recognised as a good source of natural air circulation throughout the home. The original layout wasn't the only feature that was retained. Here we can see the restored timber ceiling beams. These are visible from every room and really imbue the space with the original rustic ambience. At the same time the whole place has been freshened up with vast expanses of white, white paint and minimal furnishings. The floor is made from concrete and the inhabitants have lots of original style stable doors throughout the corridor. At one end of the stables we have two subdivisions combined into one. Here we have the open plan living, dining and kitchen. The space possesses an extremely limited white palette, a few bright and breezy blue cushions and a simple large wooden table. The modern fireplace is unfussy with few details. The result is a rustic place with a contemporary feel and an easy, relaxing holiday vibe. Moving forward away from the living room end of the room, we come to the dining area where we have a better view of the extremely sophisticated kitchen layout. There are few accessories to be seen, just the large wooden dining table and a series of built in cupboards. There is little to interrupt the white lines and surfaces. 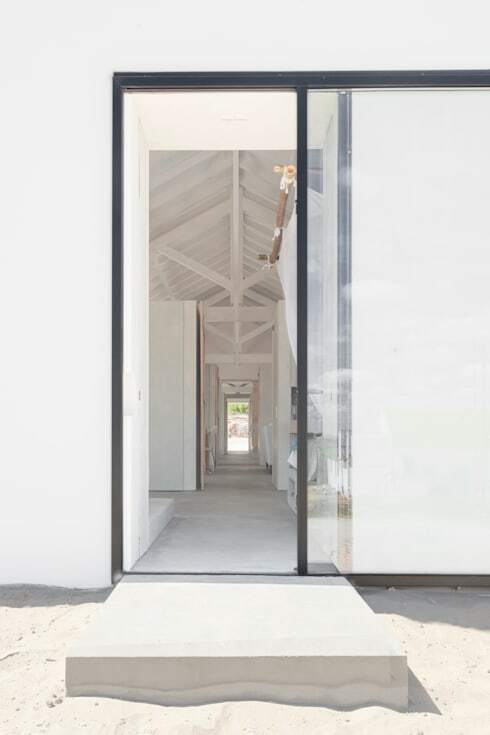 The old stable doors have been converted into windows and doors made from floor to ceiling glass. The area is extremely bright and modern. For our final photo, we'll examine our favourite room. This rustic bedroom has a bright, all white decor with a splash of vivid blue. The four poster bed has a mosquito net framed in bamboo and a tiny little built in bookcase. This just goes to show that sometimes all the decoration a home needs is white walls, wooden ceilings and lots of light. If you are interested in rustic homes, you would love this Ideabook A Cosy and Contemporary Rustic Dwelling. What do you think of the transformation of these stables? We'd love to hear in the comments below.